Lake Baikal is a freshwater ecosystem that is the deepest and oldest lake in the world, and the 2nd largest lake on the earth by volume. It lies in Southern Siberia near the city of Irkutsk. It contains over one fifth of the world's liquid fresh surface water and more than 90% of Russia's liquid fresh surface water. 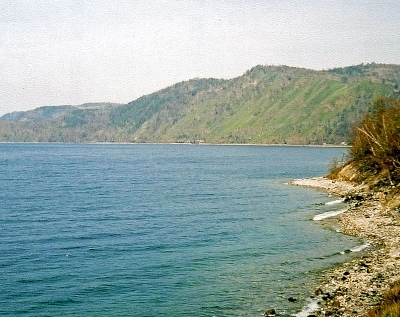 Besides the lake itself, the designated area also includes its catchment basin, the river-head of the Angarar river and the Irkutsk water reservoir. The lake is completely surrounded by mountains. Notable fauna includes the endemic Baikal seal and fish species like the omul and the Baikal oil fish. I was told when visiting Lake Baikal that to dip your hand or foot into the lake would add five years to your life, to step in with both feet would add ten years, and to fully swim would add 25 years. I may have been young and callow, but I wasn't rash enough to actually swim in those frigid waters; I limited myself to walking in up to my knees, and even then I thought I might actually have lost years from my life rather than adding them on! 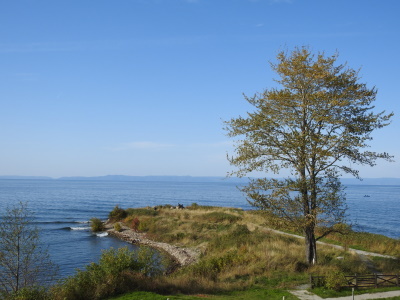 Lake Baikal has a great history, from a legend explaining how the lake and the Angara River flowing from it were formed, to more modern tales of the struggles to complete a rail line around the lake. I visited Lake Baikal during a cross-country trip on the Trans-Siberian railroad, and enjoyed both a picnic lunch with Russian shashlik (shish-kebabs) on the southwestern shore of the lake and a boat ride on the lake. The early May weather was warm, and the clear water looked deceptively refreshing; the lake's depth kept it cold, however. In fact, as we noted the next day on the train journey, ice was still present on Baikal's surface further north. The lake was as beautiful as I had imagined, and I highly recommend a visit for anyone who finds themselves traveling across Russia. I also recommend a visit to the town of Listvyanka, which offers a museum explaining the natural history of the lake as well as an outdoor museum displaying traditional wooden architecture. Logistics: Tours or transportation to Lake Baikal can be arranged in Irkutsk; a trip on the Trans-Siberian railroad will circumnavigate the southern and eastern shores of the lake. 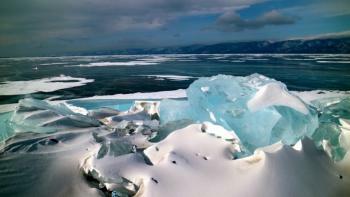 Lake Baikal is one of those WHSs you can dedicate more time to and you will not regret it. And while we're at it, let me recommend you to plan your visit for winter, when the lake is under the ice. Not only is your scope of activities wider and modes of transportation more flavourful, but the whole experience would be that much more enjoyable. There is nothing like the majestic lake crusted with a thick layer of ice clear as glass. Ivan and I went in March 2016 and took two guests with us: Ivan's brother-in-law and his classmate from the university, then created a custom trip for eight days around lake Baikal with a local tour operator Baikalika. They arranged accomodation and transport for us and a guide for a short three-hour-long sightseeing trip around Irkutsk. From there we drove to the Olkhon Island, spent two nights there, having many fun activities on the frozen lake (picnic on the ice, skating, exploring the ice caves, etc.) and enjoying our evenings in banya in our accomodation complex in Khuzhir. Incidentally, Khuzhir is a great place to explore in its own right. People still live there but it has this curious feeling of being forsaken and in abandon, helped by the rusting ships half sinking, frozen, with ice shards all around them. Shrines around Olkhon represent the two aspects of the local spiritual culture: the Buddhist and the Shamanist, each of them fascinating. From Olkhon we moved on to Buguldeyka with some small walks along the coastline, then changed into a hovercraft that took us to Listvyanka - main tourist town on the shores of lake Baykal. Mayak Hotel is your recommended place to stay, it's the best you can get, their restaurant is very good, at least some semblance of English is spoken and their banya is fantastic. They provide everything, there is a generously sized pool with cold water and you can order very nice meals and vodka to the table just beside the pool. And it's privately rented, so all yours for three or four hours. As for activities in Listvyanka, there is mushing, nerpinarium, museum, you can take a ride on snow scooters and even have a picnic on a shard of ice they cut off and send down the stream of river Angara (and then pray they won't forget about you and come for you). Another hovercraft took us across the lake to the Baikal State Natural Reserve, already part of the Buryatia Republic, where we took a hike into the actual reserve and then enjoyed lunch made by local Buryats. We also visited village of Tarabagatay where the People of Old Ways live (Starobryadtsi) whose polyphonic way of siging is an intangible World Heritage. There's also a village of Ivolginsk with their Buddhist datsan. After that, there's only a massive bust of Lenin in Ulan-Ude and you can fly back wherever you need to be via Moscow. In summer the lake is swarmed by Russian tourists who camp there and our friends who went complained about the noise, the smell, the garbage and the mosquitoes. The only annoying thing in winter are many groups of tourists (mostly Asian and Russian, with some lost folks from Europe here and there) and the cold. Clothes that will keep you warm at the temperatures of around -20 C are a must and copious amounts of vodka constitute a good coping mechanism. Should you wish to make it a tour, the travel agency I mentioned above is good, they speak English and have good track record with foreign tourists. Anyone insane enough to spend couple of days on Russian train can take the Trans-Siberian railway all the way to Irkutsk, see the lake and then continue to Mongolia and Beijing. If you want to do it on your own, some accomodation options in Listvyanka are available online and you can arrange both taxi and marshrutka between Listvyanka and Irkutsk easily. Would I reccommend seeing this WHS? In a heartbeat! I was visiting Baikal Lake in late spring (June) 2008, having seen Listwianka, Sludianka towns, Olkhon Island and travelling via so called Cirkum-Baikal railway. The most remarkable sceneries are of course those of Olkhon (the majestic Sayan mountains over the so called "Small Sea" seen from Khuzyr village is something that will be remembered for life). Nerpa seals are on display (alive) in Baikal Museum in Listwianka, the best place to start a trip is undoubtfully Listwianka (available private flats to rent as well as numerous hotels and hostels) and during season there are jet-lake transportation as far as the most northern part of Baikal (Severobaikalsk). We chose to visit Siberia in winter (as long ago as March 1989 - no doubt it will be a different world now) in order to experience it as it “ought to be” – covered in ice and snow! It was a somewhat rushed trip by Trans Siberian railway with minimal stop-overs. The train journey in from Ulan Ude takes you along the South Eastern shore with nice mountain scenery but our visit to the lake itself took us to the village of Listvyanka on a day trip from Irkutsk. The village receives more tourists than anywhere else around the Lake and has a Limnological Institute where you can learn something of the ecology of the lake. It is situated near the exit point of the Angara river from the Lake as it starts its long journey north through Irkutsk, Bratsk and eventually to the Yenisei and the Arctic Ocean. For us the most amazing part of the trip was to walk out on the ice covering the lake. Not just that but to have heavy lorries passing by! (photo). 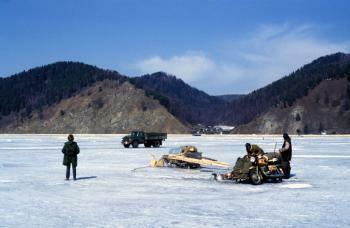 In winter the lake serves as a road on ice which is (we were told) 1 metre thick. We were led to question whether this was really enough as the ice-sheet swayed up and down in response to the passage of the lorries! No doubt those who live in Scandinavia or continental N Europe/N America are used to walking on lakes but it was a novel experience for us. The thought that this was the deepest fresh water lake in the world with up to 1.6 kms of water beneath us made it a memorable visit. The unique ecology which has led to the Lake being inscribed on the WHS list is not really accessible to the passing tourist and to that extent a visit is always going to be a slight disappointment. The famous Baikal seals are apparently visible at the Ushakanyi islands but to get to them requires a boat trip and a stay of several days in the area. I have seen the scenery praised as eg “There is probably no more beautiful place in Russia…”. This is to overdo it in my opinion. The place is, however, undoubtedly “interesting” and I would certainly recommend a winter visit.. Diplomatic Missions of Joseon Envoy Min Yonghwan: 14 September 1896 (Lunar date 8/8. Russian date 2/9) Morning rain, afternoon clear. "We travelled 120 leagues and at 5:00 A.M. arrived at the great Lake Baikal (160 leagues across and 400 leagues in length)..All day long we travelled along the lake through rocky passes and around mountain peaks. It was difficult to endure the severe rocking of the carriage. At nightfall it rained." Holiest place: Shaman Rock at Olkhon is the holiest place for the Buryats, Yakuts and Altais. Legends and Folk Myths: Natives believe that Burkhan, a modern religious cult figure of the Altai peoples, lives in the cave in the Shaman Rock on Olkhon. Shamanism: The indigenous Buryats, who practise Shamanism, believe that Olkhon Island in the lake is a spiritual place. On the west coast of the island is the Shamanka or Shaman's Rock. 78 Community Members have visited.